This post contains affiliate links. Click to learn about what this means. If you click through from my links to Amazon or some other vendors, and buy the products I use, Amazon and others may pay me a small percentage as commission, without affecting the price you pay. I only recommend products that, to my knowledge, fit within the AIP Protocol, and are of good quality – that’s why I use them! You will find most active bloggers do this, and like them I look to this practice to fund the blog and allow me to carry on actively posting. Peaches are at their peak right now and hallelujah, the price has just come right down. In BC the Okanagan is famed for its fruit trees and whilst I’ve yet to make a visit, I can at least share its bounty down the road here in Vancouver. When they are nicely ripe and juicy, peaches make a wonderful feast and it so happens when you pair them with ginger, the outcome is a pretty darn delicious one. So we all know about the benefits of ginger, right? Well, don’t overlook peaches because they’re packed with vitamins and antioxidants, they also supply potassium, iron and so much good stuff you may like to think again about buying unprescribed over the counter supplements and go buy some peaches instead*. Apparently they are a good choice in helping kill off breast cancer cells, will help remove worms from the intestines and reduce anxiety so add another one to your brown paper bag. The Chinese use the peach as a kidney cleanser and detoxifier, so why don’t you go grab one more while you’re at it. Then because this fruit can reduce heartburn, inflammation, hair loss, calm an upset stomach and control the body’s ageing process .. well surely that bag must be full by now! Having said that, go easy on quantities and remember too much sugar, even in fruit, can slow your healing process down. Did you know I’m on Pinterest? What a fantastic resource … for anything actually but it has to be the go-to place to search out recipes for the AIP Protocol. Today’s recipe is adapted from one I found via Pinterest which, incidentally, is utterly delicious – only I wanted something more suited to the warmer months and their abundance of Summer fruits. Using squash as a substitute for oatmeal is genius, believe me you would never in a month of Sundays guess the mystery ingredient. And don’t forget, a bowl of this is so much better for your brain than a bowl of gruelly grain could ever be. This, my friends, is how I love to eat. To me, this is perfection! Prepare a large squash the night before by cutting it in half across the width, scooping out the seeds and putting it cut side down in a roasting pan large enough to hold both halves. Pour a half inch worth of water into the pan and bake at 350F/180C for about 45 minutes to an hour. You want the flesh to be nice and soft, beyond that spaghetti stage so if you go over the 45 minute mark, like I did the other day when I forgot it for nearly an hour and a half, I wouldn’t worry! Carefully remove the piping hot squash halves and put them onto plates to cool before popping into the fridge overnight. Next morning, making this is the easiest thing ever and takes just minutes! * Please note I am not suggesting you do not take supplements in favour of peaches, I do however want to stress the importance of taking them only on the advice of a qualified nutritional therapist, and not self-prescribing from the pharmacy shelves. Even though this recipe uses half a large squash, I still cook this size as the squash keeps well in a covered container in the fridge. That way you’ll have enough for another oatmeal breakfast, or a good quantity you can use for something else. Put all the ingredients into a large pan, mix well and bring to the boil. Immediately turn down to a simmer and cook, stirring frequently until piping hot and the peaches have softened, approx 6-8 minutes. Resist the temptation to add more coconut milk if your mix looks rather dry at the start. Peaches give out a surprising amount of liquid as they cook so add that extra milk right at the very end, after blending, if needs be. Use an immersion blender to break down the fibres of the squash, but leaving it fairly chunky. 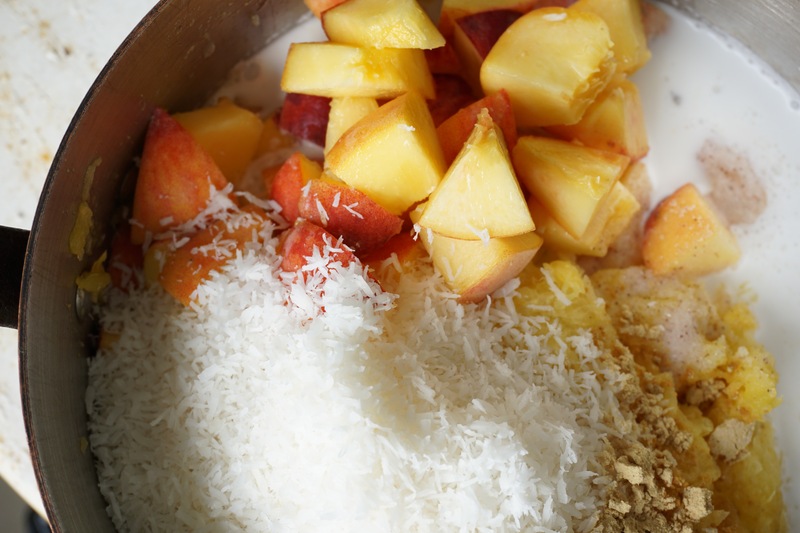 Serve the oatmeal with grilled peaches, toasted shredded coconut, however. When you make ‘oatmeals’ be sure to add some collagen on serving (which mixes in beautifully by the way) for your joint health. It’s wondrous stuff! 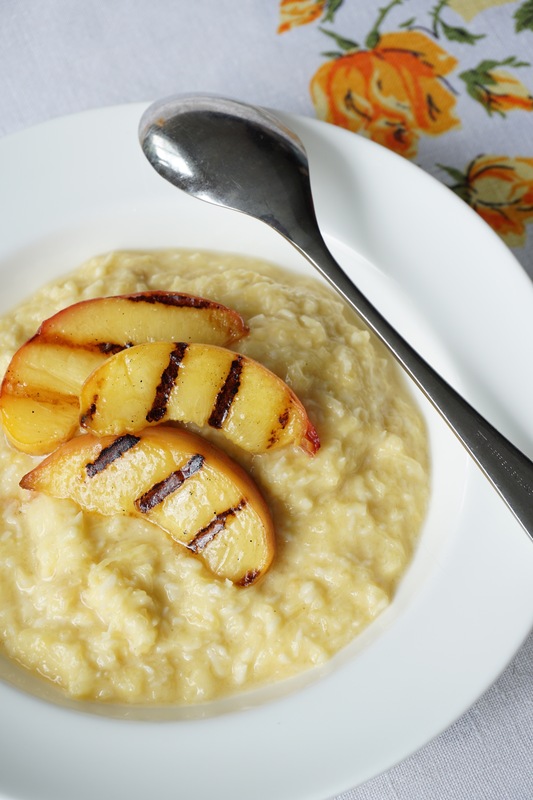 Edit : Check out this post for an Autumn/Winter oatmeal recipe you won’t want to miss! Plus for more breakfast inspiration, you may want to think about getting a copy of the e-book “85 Amazing AIP Breakfasts“! This looks absolutely amazing, I am so excited about giving it a try. Beautiful! Love your food and this site. Thanks for so many inspirational and wonderful meals! This looks great! I always thought coconut shreds would make a good “oatmeal” substitute. I used to eat them with warm coconut milk at one point. Depending on whether or not you tolerate them, chia seeds might also be a good addition, although technically they aren’t AIP. This sounds yummy and I am desperate for a new brekkie, thank you! Can you use any other form of squash: we can’t get spaghetti very much here – butternut? Hi Micki, my pleasure. Don’t use butternut squash, the flavour will be too dominant for this recipe so how about Acorn squash instead? I haven’t tried it but it is a milder squash than butternut, so will probably work fine. Hope you enjoy! Fab thanks – and thank you to for your email, that was very kind :). There doesn’t seem to be a way of subscribing to comments on here, you’re right. I have a harlequin squash I found this morning. Any good – we’re not very good on squashes in the UK clearly!? Also, I saw a recipe for dessicated coconut porridge yesterday too just that and coconut milk/honey. Have you tried that? Not sure if I fancy that! Hello again Micki, thanks for the heads up on my subscriber comments, I must get that sorted. As for the squashes, why don’t you try the harlequin. I’ve not had it before but apparently it is less sweet than the butternut so it would definitely be the better choice of the two. (Spaghetti squash is so perfect for this recipe as it is much blander in flavour so it’s there for texture mainly.) You’ll have to let me know how it turns out but I’m thinking you may need to add a little more ginger to compensate for the added sweetness, perhaps? As for the dessicated porridge you mention, I haven’t tried it I’m afraid. Have you seen my first post, AIP Pumpkin Porridge, that is another porridge (but cold) with dessicated coconut (and more pumpkin 🙂 ). That is yummy and if the harlequin isn’t perfect for the oatmeal, you could definitely use it in this one. Looking forward to hearing how you get on! Could a different fruit be used instead of peaches? What quantity would work best for blueberries? Thank you for this delicious recipe! Hi Crystal, it is my absolute pleasure, thanks for popping in. This recipe will work with any fruit you choose, I reckon, in fact I tried it with blueberries before I settled on the peaches. I can’t remember exactly what sort of quantity of blueberries I used (probably 1 cup), the flavour was good but not as pronounced as the peach and I do remember thinking it needed more. I would try putting in two cups of blueberries as a starter and see how you go. I’m going to be trying a wide variety of seasonal fruits over the year to come. Enjoy and do let me know what you think? I am cooking for one or two now, does this taste good leftover? I love peaches and am receiving radiation treatments for breast cancer (also post-surgery, which hopefully got it all), so this would be perfect if I weren’t also eating low FODMAPS. Do you have a suggested fruit for those of us on this stricter AIP? My fingers are crossed for your very speedy recovery Jane, good luck! I love squash, and have made various porridges with it. Peach and ginger sound like a fun and definitely delicious twist. I can’t wait to try it! Have you ever tried adding grass fed gelatin to it? Hi Frances, thanks for popping in and saying hello. Glad you like the sound of this, it’s certainly one of our favourites. When I remember I will add some of Great Lakes Collagen Hydrolysate, this one doesn’t set the oatmeal but is a brilliant way to ingest it without altering the food in any way. The oatmeal doesn’t need setting up. Hope you enjoy! We are more restricted than AIP at our house as 2 of us are battling SIBO and so I made this with pineapple (1/2 cup), I cut the milk with 1/2 water (I buy whole coconut, BPA free cans that are expensive and so I usually always cut with 1/2 water anyway), 1 tsp cinnamon, salt and topped with mac nuts and strawberries. Thanks for the great idea! Sounds delicious Michelle, my pleasure and thanks for letting me know your subs. Hi Kate, Thank you for this excellent breakfast option! I’ve been Paleo for one year and AIP for just over 3 months. I have missed hot cereals for the last year and this ginger peach “oatmeal” really is a comfort to me, especially with cool weather approaching. Since apple season is nearing, I plan to try the same recipe subbing out the fruit and spice for apples and cinnamon. Can’t wait! Thank you for blessing us with your recipes and sharing your journey!! It is good to know I am not alone in all of this. I’m so happy to have found your site! Can’t wait to try your oatmeal recipes…they sound absolutely delicious, and we’ve been missing oatmeal in this house! 😉 Do you think that this oatmeal will freeze as well as your pear recipe? Thanks so much! Hi Cindi, and I’m so happy you found your way here 😉 Yes, absolutely to the freezing, you can definitely do a batch cook and freeze in portions. Hope you enjoy! Finally made this today, using frozen peaches 😉 , and it was DELICIOUS!! Thanks very much! This is delicious with a bit of maple syrup. Could’ve fooled me it’s not oats. This looks seriously amazing. Might become my new favorite breakfast meal. Hello. Is there a way to make this without the peaches? I have never been a peach fan. Is there a good substitute or can I leave them out altogether? If peaches are not in season yet could we use frozen organic peaches ? Yes of course, but you may need to adjust the amount of liquid you add. I would be tempted to hold back on 1/2 cup of coconut milk to begin with and add it back in later if necessary. Not peachy at all. Not sweet at all. I only used 1t of salt. I guess its too much. Did you use 1 tsp or 1 tbsp salt in the oatmeal. Also, I don’t know where you live but peaches are not in season where I am. If you used out of season peaches, could it be a lack of flavour there? I am very much looking forward to making this dish! Do you think the other cooked half of squash would freeze well for the next batch? If I made a big batch could I freeze individual portions? Does it freeze well once made? So the spaghetti squash is raw when you add it to the pan? The squash is cooked beforehand, as per the instructions in the text. I do this the night before. I found you on Instagram and immediately fell in love with this website and recipes!! I hope you’re working on a cookbook?!?!?! I’ll be the first in line to order it….as well as all my AIP friends. THANK YOU for putting this site up and sharing your amazing story and recipes!! I am brand new to AIP cooking and just diagnosed this week with Hashimotos. I am feeling overwhelmed by my new limitations and time in the kitchen. Your recipes look good and i cant wait to try some “oatmeal” as i am already tired of meat for breakfast. I am wondering if this breakfast has enough protein to get you going in the AM. I do know that breakfast high in carbs makes me so tired and sluggish. I am curious about the amt of carbs from the squash and fruit. Any comments helpful as i am rethinking breakfast foods. Hi Amy, this breakfast is a low carb, low starch meal and when I serve it I like to add some collagen to get some protein in there. http://healingfamilyeats.com/great-lakes-collagen-hydrolysate. Yes, have a read of the text before the recipe for instructions on how-to. Do you have any ideas of a substitute for the coconut? Your oatmeals look wonderful and I would love to try them! Would it be crazy to try just leaving them out? Thanks Lora. You could always use a little water and add some fruit (such as apple purée) and raisins maybe for sweetness and texture, followed by a sprinkling of sea salt and cinnamon. If you want it even sweeter, try using a different squash, such as butternut or acorn. Or, if you eat plantains, why don’t you take a look at Dora’s breakfast casserole. It looks and sounds delicious but I’m afraid I haven’t tried it as we don’t eat plantains here. I much prefer minced fresh ginger in this lovely recipe, really adds bright flavor and zing! Hi, Wow, this looks delicious! Unfortunately, I’m not a fan of the taste of coconut. I’m aware of the health benefits so I try and work in a couple of tablespoons of coconut oil a day but I’m wondering if there are any possible substitutes for the flakes? Thank you! Not really. I would try adding a little more squash instead, I’m sure it will still be good. I will try both and will let you know. I will also keep looking for spaghetti squash so I have a “taste reference” to your wonderful looking recipe. But sweet sounds very appealing… I started the AIP 5 month ago and right now I’m in the process of reintroducing food again. I find this the hardest part so far! I have huge cravings for sweets and slipped several times (couldn’t resist a Lindt chocolate easter bunny). Yes, this looks so good but I have never seen one of these squashes in Australia! It’s a travesty. Will have to do a serious hunt on the weekend. Your website is amazing by the way. Thanks so much Varia. I have heard it’s possible to find the spaghetti squashes in Australia but not easy. You can substitute with acorn squash if that helps. I’m Kate, mother of two, wife of one! I’m also a Nutritional Therapy Practitioner, Restorative Wellness Practitioner, Certified Gluten Practitioner, Certified AIP Coach and qualified chef, living the dream in Vancouver, BC. I’m passionate about the health of myself, my family and YOU. It’s great to have you here, make yourself a mug of bone broth and hang out with me for a while. I'm Kate Jay, mother of two, wife of one! I'm also a Nutritional Therapy Practitioner, Restorative Wellness Practitioner, Certified Gluten Practitioner, Certified AIP Coach and qualified chef, living the dream in Vancouver, BC. I'm passionate about the health of myself, my family and YOU. It's great to have you here, make yourself a mug of bone broth and hang out for a while. The purpose of this blog is to share the recipes I make for my family as part of our journey to better health. From time to time I may make reference to our own healthcare treatment. I am not a functional or medical practitioner, therefore any opinions I share are my own and should not be construed as healthcare advice but for educational purposes only.